At the Earth and Environmental System Modeling (EESM) PI Meeting in November 2018 at the Bolger Center in Maryland, the E3SM project recognized “Critical Path” team members for their outstanding effort in bringing Phase 1 of the E3SM model to fruition. Sharlene Weatherwax, the Associate Director for Biological and Environmental Research at the Department of Energy, presented the awards. Formed in the final stages of E3SM v1 model development to address multiple code problems and model deficiencies, the Critical Path team worked tirelessly to resolve all the issues to deliver v1 on time. The team met every 2 to 3 days for approximately 3 months to deliver v1 with standard resolution as well as perform 150 years of CMIP6 DECK core simulations by the April 2018 release deadline. 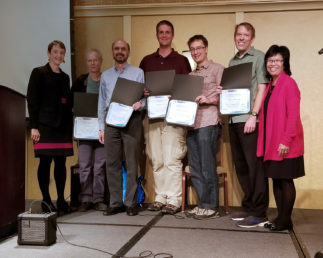 Dorothy Koch, DOE Program Manager, Jon Wolfe, LANL, Chris Golaz, LLNL, Luke van Roekel, LANL, Peter Caldwell, LLNL, Mark Petersen, LANL, Sharlene Weatherwax, Associate Director for DOE BER.